It looks like the Michael Jordan vs. LeBron James beef has reached another level than the usual fan bases arguing back and forth with each other. LeBron’s James’ camp and Michael Jordan’s camp have some reported beef with each other and it has everything to do some video footage of His Airness that LeBron’s crew wanted to use for a documentary. “They hate each other – these two camps,” a source told Richard Johnson of Page Six. The report goes on to say that rejection from Jordan’s camp lead to LeBron making the bold claim of crowning himself the GOAT after defeating the 73-9 Golden State Warriors in the 2016 NBA Finals. Without the Jordan footage, the film about the 1984 NBA draft, in which Jordan was selected third, had to be changed, and it became a three-part documentary about the civic activism of basketball players, “Shut Up and Dribble,’’ which Showtime aired in November. 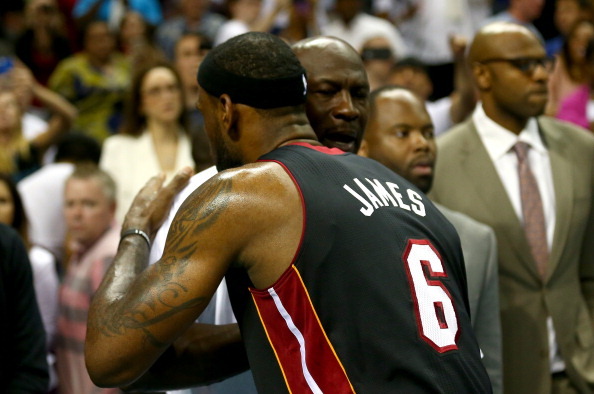 “LeBron was pissed at Michael Jordan — that’s why he lashed out,” one source told me.